It is almost time to start counting down to Christmas…officially. My girls are anxiously awaiting the arrival of December. In our house we count down to Christmas in 1, 2, 3, 4 different ways. Does this sound like overkill? Maybe. The truth of the matter is that each of our advent calendars has a special meaning and I just cannot let any one of them go. So, here we go. If your looking for a fun way to countdown to Christmas give 1, 2, 3 or 4 of these a chance. To make your own felt tree you will need 4 pieces of green felt, 6 pieces of red felt, 2 pieces of white felt, scraps of brown and yellow felt. On a large piece of craft paper draw your tree, this will be your template. Cut the red and green pieces of felt to be the front and back of the tree. Cut out 24 small squares, these will be your pockets. 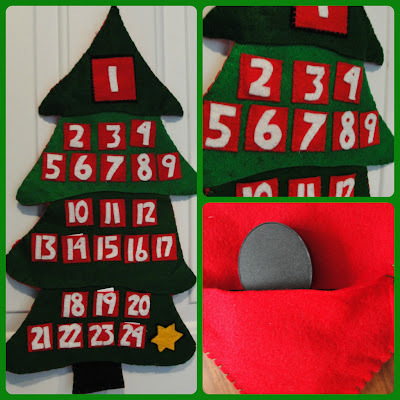 Use the white felt to cut out the numbers 1 thru 24. Stitch the numbers onto the pocket squares. Stitch the star onto the 25 space. Stitch the pockets onto the tree front. Stitch the front onto the back. Cut out a tree trunk from the brown felt and stitch onto the green front of the tree. I left an opening for a large magnet in the back of the tree and stick the tree to our metal front door. We use this tree to keep track of the date. We slip a small candy cane into the #1 pocket and each day we advance the candy cane until Christmas Day. 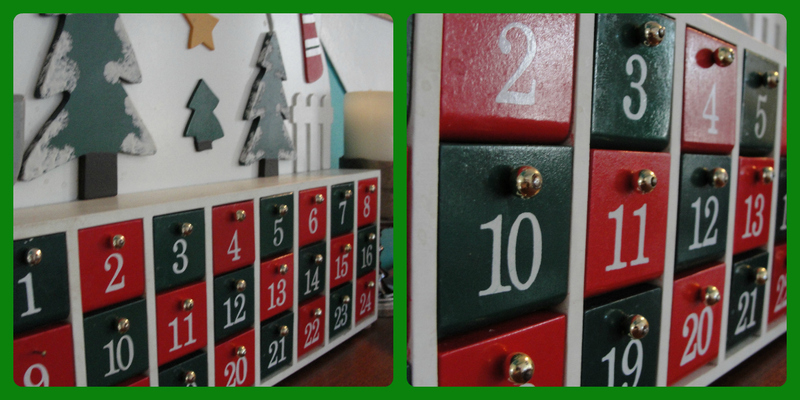 Our wooden snowman advent calendar was purchased for my eldest daughter’s first Christmas. My mom gave it to her and we’ve been using it ever since. What I have realized is that it doesn’t really matter what you use, what matters is the story. My girls believe that every night elves come into our house and place two chocolate christmas balls behind the corresponding door. These little elves know if they’ve been bad or good…so they had better be good, for goodness sake. Our third advent calendar is a beautiful handmade piece of art that my sister made, again, for my eldest daughter. I featured this advent calendar last year. 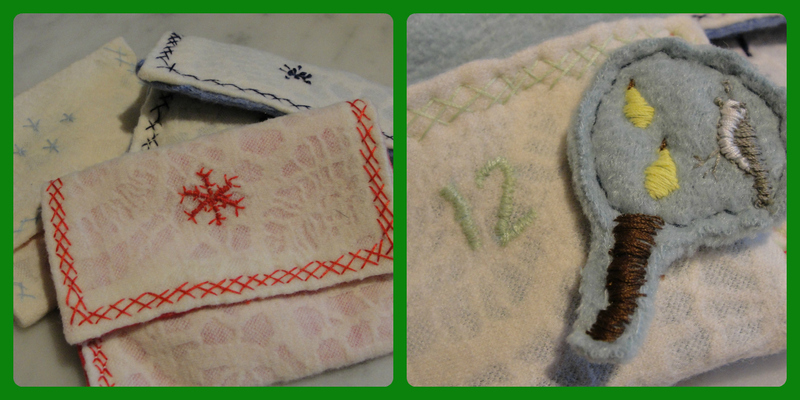 It is a series of handmade fabric envelopes filled with handmade fabric symbols of Christmas. You can read the full story, which is a truly lovely story, right here. The newest in our family of Christmas countdowns are our sweet little comical elves. This year will be their very first time being introduced to my girls. 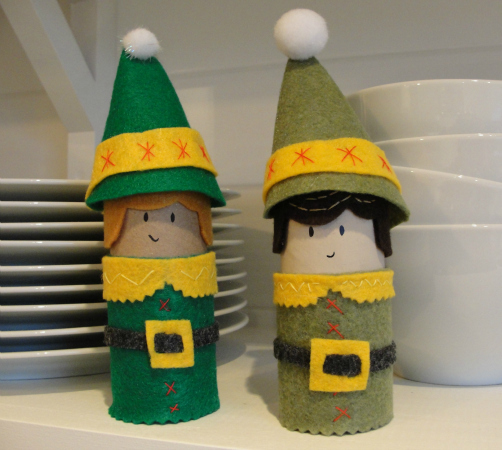 I made 2 funny little elves out of toilet paper rolls and felt scraps (tutorial to come). Every night I will be hiding the elves somewhere in the house. When the girls find the elves they will find a Christmas joke hidden inside. We love festive knock, knock jokes and riddles. A great source for kid-friendly Christmas jokes and riddles is Activity Village. I cannot wait to share this new tradition with my girls. Now, when I was a little girl we too had a fun Christmas countdown tradition. We would hang a Christmas wrapping paper chain from the wall. Each link was numbered. Every night we would rip off another link and sing. I guess my mom must have invented the countdown song. “24 days ’til Christmas and Santa’s on his way! Hey!” The goal really is to sing it really loud! I love singing this simple musical tradition with my girls. I guess that’s what I value most about the holidays, sharing traditions and creating new traditions. 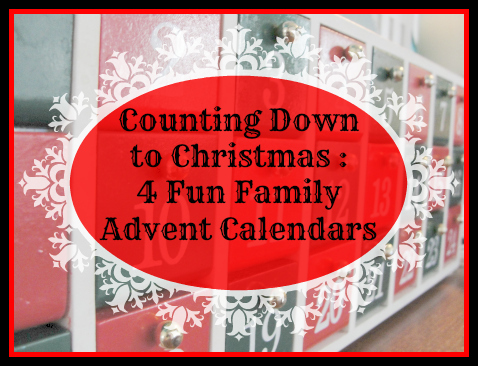 Do you have a Christmas countdown tradition? What did you do when you were a child to countdown to Christmas?